This FREE pirate themed math center game focuses on students identifying prime and composite numbers. The game comes with a full color game board (that also looks great in black and white) and a half page card with student instructions. The only other materials you will need to play this game are 12 coins, game pieces, and 1 die. 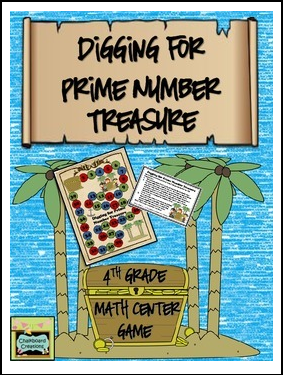 This game is great for math centers, math workshop, or early finishers! Go to your My Purchases page. Beside each purchase you'll see a Provide Feedbackbutton. Simply click it and you will be taken to a page where you can give a quick rating and leave a short comment for the product. I greatly appreciate customer feedback so that I can continue to make useful resources for you! Also, be the first to know about new products, sales, and FREEBIES!